"This wonderful and easy skillet pasta dish includes sun-dried tomatoes, olives, pine nuts, feta cheese, and crushed red pepper flakes. This is an authentic alternative that gets rave reviews in our family." Bring a large pot of lightly salted water to a boil. Place farfalle pasta in the pot, cook for 8 to 10 minutes, until al dente, and drain. Heat the oil in a large skillet over medium heat, and cook the garlic until lightly browned. Mix in red pepper and lemon juice. Stir in the pine nuts, olives, and sun-dried tomatoes. 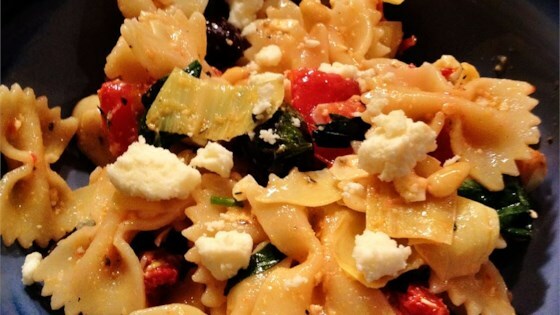 Toss in the cooked pasta and feta cheese. Season with salt and pepper. I LOVE THIS SO MUCH!! I make it about once a week. At times, I have added more garlic and chicken. It is great hot or cold! very simple, I added chicken and avocado, my husband really liked it, and don't leave out the nuts, that makes the dish! This recipe is so good that it has become a staple in my house. We can't get enough of it!